Hosted by Director Sara Fishko with discussion following the screening. Between 1957 and 1965 in New York, dozens of jazz musicians jam night after night in a dilapidated Sixth Avenue loft, not realizing that much of what they play and say to each other is being captured on audio tape and in still pictures by the gentle and unstable genius, former LIFE Magazine photographer W. Eugene Smith, who lives in the loft space next door. Meanwhile, Thelonious Monk stops by for three weeks of rehearsals; drummer Ronnie Free gets hooked on hard drugs, having been turned on by a drummer who was his boyhood idol years before; loft-resident Hall Overton, Juilliard instructor and classical composer, becomes a jazz guru; the 50s give way to the 60s; Smith begins to record his own phone calls and visits from the local police; the world changes—and Smith gets evicted. Photographer W. Eugene Smith recorded 4000 hours of audio tape and took 40,000 photographs in the Jazz Loft between 1957 and 1965. This is the first film to make use of this archive, now housed at the Center For Creative Photography at the University of Arizona. 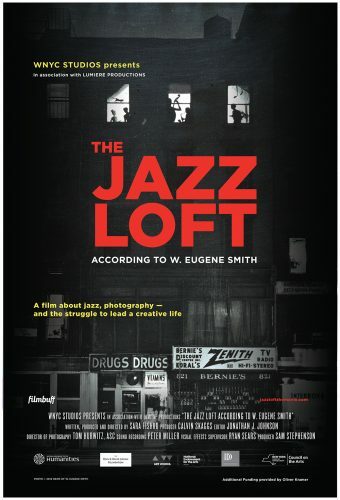 This documentary, “The Jazz Loft According to W. Eugene Smith”, has been selected by over 15 Film Festivals and Competitions, as well as being chosen as a New York Times ‘Critics Pick’.